We've shopped around, so you can make the right choice. With us, you'll receive the expertise of Factory Trained Technicians who are equipped with Specialized Tools, and use Genuine Subaru Parts for the job. Every service comes with a free Multi-Point Inspection and our little extras while you wait. At Carter Subaru Shoreline, we understand that we're not the only place in town that maintains, repairs, and services Subaru vehicles. However, we want to prove to you that we're the best. There's a rumor that's been around for a long time suggesting that getting your Subaru serviced at the dealership may not be the most affordable option. 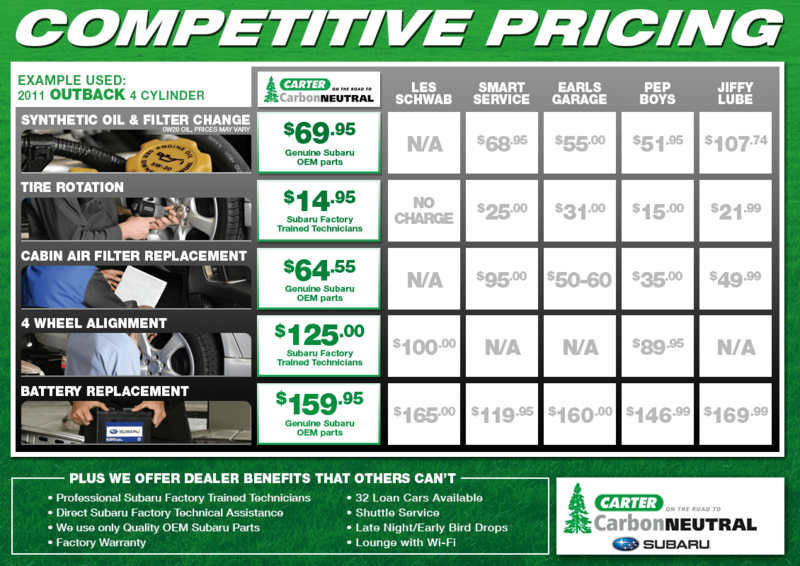 We went to get the facts by comparing our Subaru service and maintenance pricing to other shops. What we found is that you'll get better service, parts, and products when you trust the care of your Subaru with our state-of-the-art service center. From basic maintenance like oil changes and tire rotations to more involved maintenance, our pricing is competitive with other shops that don't specialize in Subaru engineering. Subaru service, maintenance, and repair are important for getting the most from your vehicle, but not all mechanic shops and service centers are the same. In our service center at Carter Subaru Shoreline, you'll find some of the best factory-trained Subaru technicians in the business who know every inch of your vehicle. We'll only use OEM and factory-approved parts when taking care of your Subaru, and these are readily available in our parts department if you would prefer to do it yourself. Not only will your Subaru get the best, but we've recently been awarded the 2017 Subaru Stellar Care award that proves we remain dedicated to our customers above all else. Get more for your money with our frequently updated special offers on Subaru maintenance and repair, and learn more of what to expect in our Subaru service information pages. When you're ready, feel free to schedule an appointment online. For expert service while you wait, stop by our location at 17225 Aurora Ave N., Seattle, WA 98133 when it's convenient. We look forward to meeting you at Carter Subaru Shoreline where we proudly serve Lake Stevens and Mukilteo, WA.